The $3 billion incentive package used to lure Foxconn to Wisconsin to build a giant factory was only the beginning. Associated sweeteners have now grown to more than $4 billion -- adding in the cost of local government incentives and various infrastructure projects, like roads and highways, sewer and power lines. Foxconn is also being allowed to skip state environmental rules and oversight it would otherwise have had to follow. 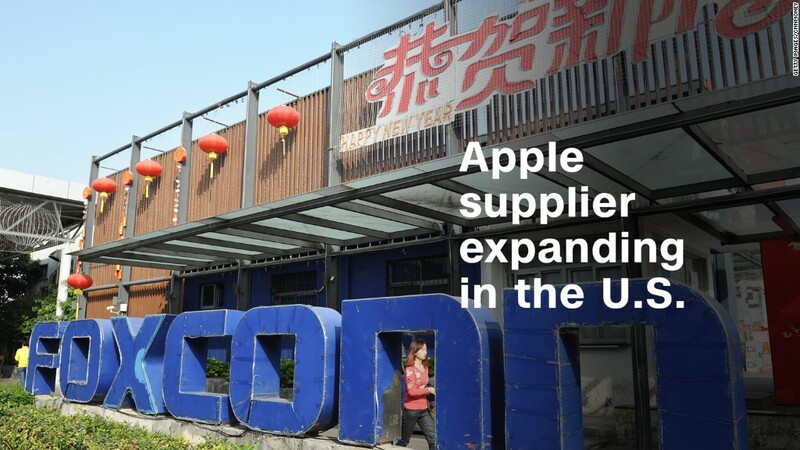 Taiwan-based Foxconn is best known as the electronics manufacturer that builds things like iPhones at massive factories in China, where employees not only work but live. The plan to build the flat screen plant in Wisconsin, announced in July, was hailed at the time by President Trump and Governor Scott Walker as a sign of a rebirth of American manufacturing, winning back jobs that had been going to China for years. "This is a once-in-a-century opportunity for our state and our country, and Wisconsin is ready," said Walker at the time of the announcement. Construction on the facility is expected to break ground in 2018. The jobs are expected to pay about $53,000 a year. Walker vowed it would give Wisconsin its own version of Silicon Valley. But the low unemployment in the state has some existing businesses worried that the plant, which could employ up to 13,000 workers, will make it that much harder for them to find workers. Unemployment in Wisconsin is just 3.2%, near its record low. The entire state has only 102,000 unemployed workers. "What I'm hearing from my employers is they can't fill the jobs they have available now," said Anthony Snyder, CEO of the Fox Valley Workforce Development Board. "I've heard companies not able to add another shift, not being able to take on orders because they can't fill them. Foxconn doesn't worry me today, but it'll worry me two or three years from now. It's another competitor for the labor we don't have here." In fact, among the additional costs to the Foxconn project is a $6.8 million advertising campaign to woo workers from out of state to work in Wisconsin, including at the new plant. But it's mostly the overall deal's rising price tag that has made it so controversial. It is poised to become a major issue in the 2018 governor's race in which Walker is seeking a third term. Among those who voted against the package when it appeared before a state economic develop agency was State Rep. Dana Wachs, a Democrat, who is one of numerous Democrats running for governor. "It's way too much money and it never seems to stop growing," Wachs told CNNMoney this week. "It just keeps on taking from Wisconsin taxpayers. There is a substantial negative reaction to this deal all over the state. I can't go in the grocery store without people stopping me to talk about this issue." The state's package is poised to give the company up to $3 billion in tax credits and breaks. It would be one of the biggest incentive packages ever promised a company to locate a plant in the United States. And, according to Wisconsin's estimates, it will take until at least 2043 for the state to recoup that lost tax revenue. But that's not the full package. The Village of Mount Pleasant and Racine County, where the plant is to be built, have also agreed to provide $764 million in tax incentives to help get the facility constructed, including buying the land and giving it to Foxconn for free. The state expects to spend about $400 million on road improvements, including adding two lanes to the nearby Interstate 94. And it's seeking $246 million more in federal money to help pay for the interstate expansion. In addition, the local electric utility is upgrading its lines and adding substations to provide the necessary power that will be used by the plant, at a cost of $140 million. The cost of those projects will be paid by 5 million customers in the area. About half the state's tax breaks depend upon how many workers Foxconn hires. While the state touts Foxconn's plans for 13,000 workers, the company has only committed to hiring 3,000 at this point.